For the first time in English, a comprehensive work consisting of 2 Volumes commenting on al-Nawawi's Forty Hadith. If you enjoyed He came to teach you your religion, then you will certainly love to see the latest work Commentary on the Forty Hadith of al-Nawawi by Jamaal al-Din M. Zarabozo with an Introduction by Prof. Jaafar Sheikh Idris. 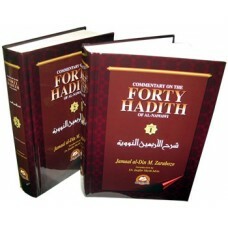 * A new translation and commentary of the hadiths. * A thorough commentary on each hadith. * A list of Arabic words and phrases. * A discussion of the status of the hadith. * Biographical sketches of the companions. * A presentation and discussion of scholarly interpretations of each hadith. * An introduction to technical terms.